When you need it, get instant support for select issues with troubleshooting videos and guided service. 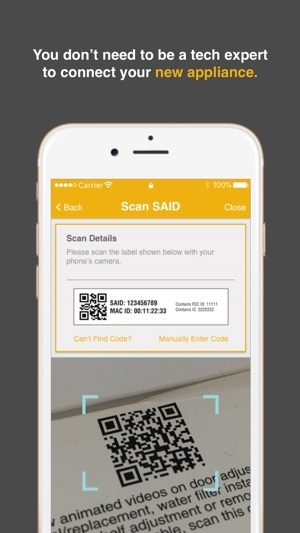 Scan-to-Connect technology means your smart appliances can be up and running quickly. 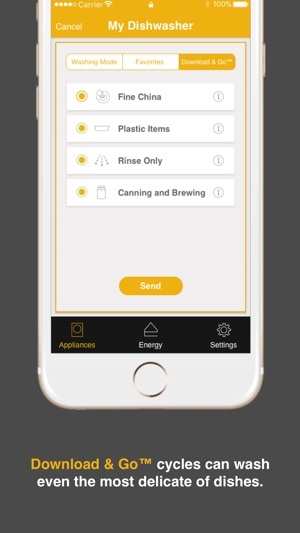 - Manage laundry day from anywhere by assigning family members tasks like transferring a load to the dryer or folding clean clothes. They'll get the notification on their smart devices (select models). - Personalized Quick Tips make sure your family’s laundry gets the care it deserves, while helping laundry day go more smoothly (select models). - Receive helpful Laundry Alerts, which let you know if there's an unbalanced load that may affect performance. - Follow step-by-step instructions and select how-to videos to help guide you through quick fixes with the Diagnostic Tool. *Features may vary by product and are subject to change. Compatible connected appliance required. Details and privacy info at whirlpool.com/connect. **Select recipes only. Details and privacy info at whirlpool.com/connect and yummly.com/privacy. *** Not all frozen foods included. 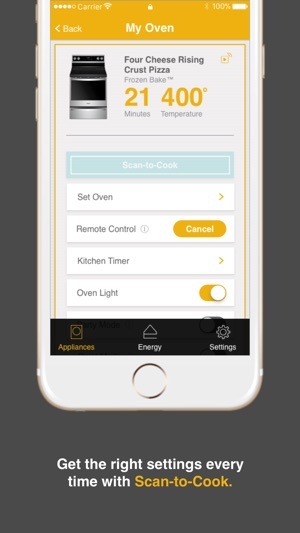 † Cooktop elements cannot be turned off remotely from the app. Google, Google Home and other related marks and logos are trademarks of Google LLC. Amazon, Alexa and all related logos are trademarks of Amazon.com, Inc. or its affiliates. Nest® and Nest Learning Thermostat™ are trademarks licensed by Nest Labs, Inc.
Do not waste your time with Whirlpool „smart“ appliances. 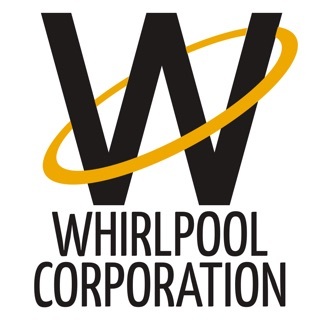 Love he Whirlpool products from a reliability standpoint, but a digital company they are not. Good old mechanical engineering is what they are good at and make a reliable product but the digital age will leave them behind if this generation of smart appliances and app are their answer to it. Have a washer and dryer pair that took forever to get connected till it finally worked. Now, despite the pair working and sending text messages (that are correct), the status in the app never changes. The dryer is permanently in „Idle“ despite an Text telling me that my clothes are dry. And a washer that constantly shows 41 minutes left in the cycle. Device resets (full power off) and app reinstall does not correct the problem. FrankKeyDee- We apologize for the trouble with the Whirlpool app. You may need to refresh the app by dragging the screen down. If that doesn't resolve the issue to accurately reflect the status of the appliance, please call us at 866-333-4591 M-F 8am to 6pm EST and we can address your concerns. 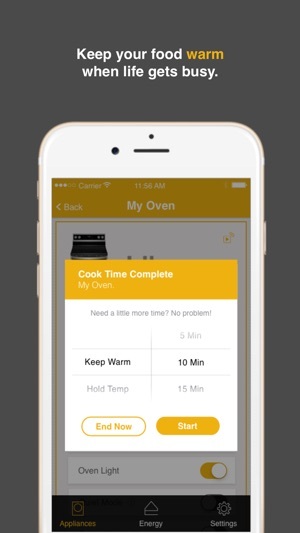 We paid more for the fancy appliances you could operate with this app. Upon trying initial setup I waited on hold with customer support for 45 minutes only to be met with an employee who seemed annoyed I called to bother him. Got enough info from him that finally got things to work. The app itself reads in Centigrade. We cannot find how to change to Fahrenheit so if I want to use the app to turn oven on I first have to convert my temps. Quicker to go to the oven and just turn the darn thing on. We emailed customer support to ask about this and days later got a response to call to ask instead. Yeah, another long wait for grumpy support people? No thanks. There’s a huge lag in app telling me a timer is done so I cannot rely on that and just use a secondary alarm on my phone. If you could simply tell me how to change temp in app to Fahrenheit I’d be a happier customer. Keepitoldschool- Sorry you had a long wait time with customer service. You can change the temp from Celsius to Fahrenheit in the app by toggling from Fahrenheit to Celcius and back on the appliance under Tools, Preferences, Regional. If you need further help Please reach out to our Connected Care Team directly at 866-333-4591 M-F 8:00 AM and 6:00 PM Eastern Standard Time. Is nice to buy some nice appliances for your home like one of the named brand Whirlpool that people love. But when it comes to new technology they are simply not ready for it. With all the build in WiFi touch screen and etc features you can’t simply turn off the hood fan when is overheated. Yes it is a safety feature but don’t we get to decide if we want it off or not? Having to unplug the unit if you need to leave in a hurry and reset everything later is time consuming. It supposed to be more efficient not a burden? Btw calling the customer service only make it worst, long waiting and non useful advice. And guess what is too late to return it now. Perhaps is less stress cooking with a camping stove on the dining table than expensive set of whirlpool. You reading this?- You are correct that the fan cannot be turned off if there is to much heat with the unit and it will turn off after the unit is cool. You are correct that this is for your families safety. If you have sufficient air flow in the room this will cut down on the time that it takes to cool properly. If you have further questions Please reach out to our Connected Care Team directly at 866-333-4591 M-F 8:00 AM and 6:00 PM Eastern Standard Time. ® /TM ©2019 Whirlpool. Used under license in Canada. All rights reserved.